“Migration”, an original painting by Linda. In this two day workshop you will develop a new approach and perspective to capturing images around you, and translating those images on to a canvas. We are thrilled to welcome Linda as a guest instructor to the Art Center to give us a unique look at the world of abstracts. You will create 3 distinct paintings that can work as a “tripych” set, or can be hung individually. Students will need to purchase supplies; the list is below. This is a unique chance to create a beautiful abstract body of work ready to hang in your home, or pass along as a gift, with hands on guidance from a Master! There will be a lunch break both days, so you are welcome to bring your own, or buy lunch from Tough Cookie Bakery, now located in the Art Center. All levels are welcome, including absolute beginners, ages 16 and up. Acrylic Paints: Student grade are fine, any colors you have. Recommended colors: Permanent Rose, Quinacridone Rose, Cadmium Yellow Pale, or Light, Pthalo Blue, Titanium White, Mars Black). (1 Tube Each) Oils or watercolors are fine, but have some acrylics on hand. Linda Montignani has been making art for over 25 years. She received her MFA from American University in Washington D. C. and taught there at the Maryland School of Art and Design. 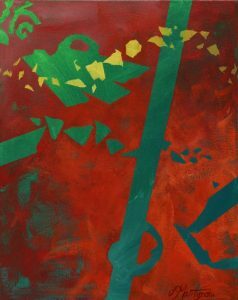 She was represented at City Gallery in Georgetown, and was a member of A.Salon, a group of artists who had studios and exhibited their work in a former manufacturing plant in Takoma Park, MD. After she and her husband Steve moved to Austin, Texas in 1992, Linda taught fine art, graphic design and illustration at St. Edward’s University for 10 years. She currently teaches many drawing, painting, mixed media, color, collage and abstraction classes at The Contemporary Art School at Laguna Gloria, and has done so for the past 20 years. She also teaches coaching classes and workshops throughout Texas. 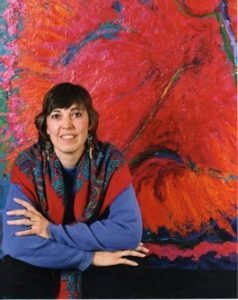 Linda has exhibited widely throughout the US and abroad, and has work in many corporate and private collections. She has had her work shown in films, and has done mural commissions for restaurants, interior designers and private residences. Linda is a founder of several art organizations, including the Creative Arts Society, VU-Austin, the Austin Artists’ Co-op, Artitude, and currently NeoArt. To find out more about Linda’s exhibitions and classes, visit her web site at www.aardvarkstudio.com or contact her via email at lindamon108@gmail.com. Artist Statement: Ephemeral~ Art for me usually ranges from realism to colorful abstractions to more surreal and mystical paintings. My process of working takes the form of a pendulum at times. It swings back and forth between the study of Nature, Her color and composition, and intuitive expression from within myself, which sometimes takes a more mystical form. Having practiced meditation for more than half my life, when I immerse myself in the creation of art, it also becomes a process of meditation. When working in silence and connecting with that deepest part of myself, whether working from reality or memory or allowing images to arise as they will, diverse and surprising compositions result. My most recent series is called Ephemeral, and is about those moments when a reflection, or cloud shape or shadow catches the eye, makes an impression, and then is gone. Those fleeting moments make up the continuum of our lives, whether they are visual, emotional, or existential. When creating the images of those moments, I like to place them visually at the junction point between realism and complete abstraction, and, in that way, as the real dissolves into the abstract, the experience of the painting itself becomes ephemeral. I search out images that are visually placed between those two extremes and then paint them using acrylic and sometimes encaustic and mixed media to create pieces that I hope transmit the feeling of the original experience. There is conflicting info on the dates of this. One says February, one says March. Can you help me? Thanks! Sorry about that! It’s March 9th & 10th from 10:00am-4:30pm.